The revenue losses, estimated at UAH 2 billion ($74.2 million) per year, came from “contract cancellation by Russian clients in the space and military industry,” according to a recent IMF report. The figure covers 11 operating companies managed by Ukraine’s State Space Agency. The two largest enterprises are the Yuzhnoye Design Bureau and the PA Yuzhmash manufacturing company, which work closely together on Ukrainian launch vehicles. 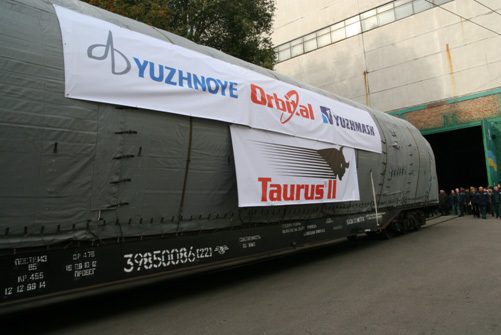 Yuzhmash produces the first stages of the Zenit and Antares boosters and a fourth stage for Europe’s Vega launch vehicle. The company is also involved in the conversion of retired ballistic missiles into Dnepr satellite launchers as part of a joint program with Russia. However, Russia is phasing out use of the Zenit and Dnepr launchers. Russia is shifting over to using Angara and Soyuz-2.1v, newer rockets the nation produces domestically. Russia is also switching to domestic manufacturers for space components to reduce their dependence on foreign suppliers. Ukraine’s space industry also suffered a setback last year when the Brazilian government pulled out of the long-troubled Cyclone Space joint venture. The company was to launch Ukraine’s Cyclone-4 rocket from Brazil’s Alcantara Launch Center. The Soviet-era Zenit booster is used by Sea Launch, Land Launch and for occasional Russian government launches. Ukraine produces the first stage while Russia supplies upper stages. Sea Launch — which has suffered financial setbacks, bankruptcy and launch failures — last launched a Zenit booster from it’s ocean-going platform in May 2014. Three months later, the company announced a series of cost-cutting measures designed to deal with a gap in launches. Those measures included staff reductions and taking its launch platform and command ship out of service. Sea Launch’s majority owner, Russia’s RSC Energia, has been trying to sell-off Sea Launch over the past several years. Media reports say that talks were conducted with Brazil and China, among other interested parties. None of those talks appear to have produced any agreements. In addition to a lack of potential buyers and satellites to launch, Sea Launch also has a large financial judgment hanging over its head. In September, Boeing obtained a $356 million judgment against partners RSC Energia of Russia and Yuzhnoye relating to Sea Launch’s 2009 bankruptcy filing. Boeing originally owned 40 percent of the joint venture with RSC Energia, Yuzhnoye and a Norwegian company owning the rest. RSC Energia secured 95 percent of the company after Sea Launch emerged from bankruptcy; Boeing currently owns 2.5 percent. Variants of the Zenit booster are also periodically launched from the Baikonur Cosmodrome in Kazakhstan. The most recent flight was in December when a Zenit successfully orbited a meteorological satellite for the Russian government. Media reports indicated that the flight could be the last launch of a Zenit booster. However, there were indications after the flight that efforts to market the booster would continue. It’s a shame the Ukraine will probably be unable to align those who are less corrupt with those able to govern . It may just not work for them. Meaning they’ll have a counter revolution, and go back into the Russian camp until the rate of looting of Ukraine gets out of hand again, and the cycle will repeat. We’re in the 4th cycle of West East swings. Poor Ukraine will become poorer each time the cycle runs it course. Such human and agricultural potential lost for another generation. “probably not be unable to align those who are less corrupt with those able to govern” – What was this supposed to say? Yes, swinging back and forth does come with costs, as we are seeing with their aerospace industry. In the long-term, the corruption is the real problem, not the swings. Hopefully this time the people make the politicians stick to the corruption cleaning since there will be at least several years of hardship either way. I am not sure if it is a Slavic model. It doesn’t happen say in Slovakia, Slovenia, Czech republic or Poland.